As a bit of departure from the previous fortifications, the other two major works built to defend Leesburg have a bit more speculation attached. Forts Beauregard and Johnston served to defend the town from the southeast and northwest, respectively. Both were likely started after the Battle of Balls Bluff, as the Confederates strengthened their defenses in reaction to that Federal probe. Confederate engineers placed the fort on a 430 foot elevation almost due south of town. Looking from the present day “Outlet Mall” (a good landmark in the region I guess!) to the south this rise clearly still dominates the approaches to the town. 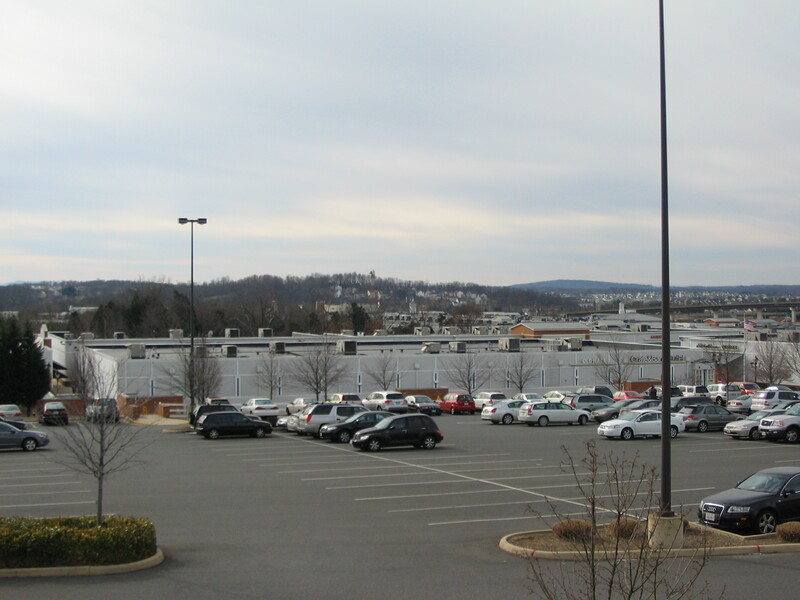 The hill Fort Beauregard stood, or was intended to stand, on is just above the mall buildings in the photo above. Just as orientation to the roads, Virginia 7 passes from left to right in the valley behind the mall complex. US 15 is on the right, heading south into the distant center, behind the fort’s location. Take away the buildings, and you have a good field of fire on either side. 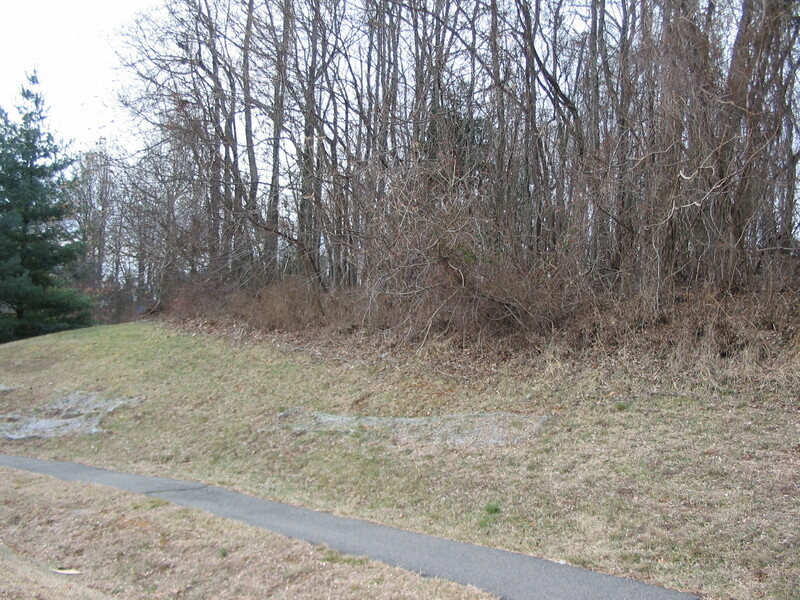 The Milner Associates researchers, in Documentation of Eight Civil War Forts and Earthworks in the Vicinity of Leesburg, Virginia, described the fort as rectangular. As with the other fortifications at Leesburg, no engineering diagrams were made or have survived. And complicating the study more, the Confederates might not have completed the works. The site today is within the aptly named “Beauregard Estates” subdivision. The area is privately owned. Fortress Circle and Beauregard Drive enclose the crest of the hill, and the most likely location of the works. The best way route to the site, from the bypass of Va 7 and US 15, is first a turn south on Sycolin Road (CR 643). From there after half a mile turn left onto Battlefield Parkway (which seems to connect many of our fortification sites!). 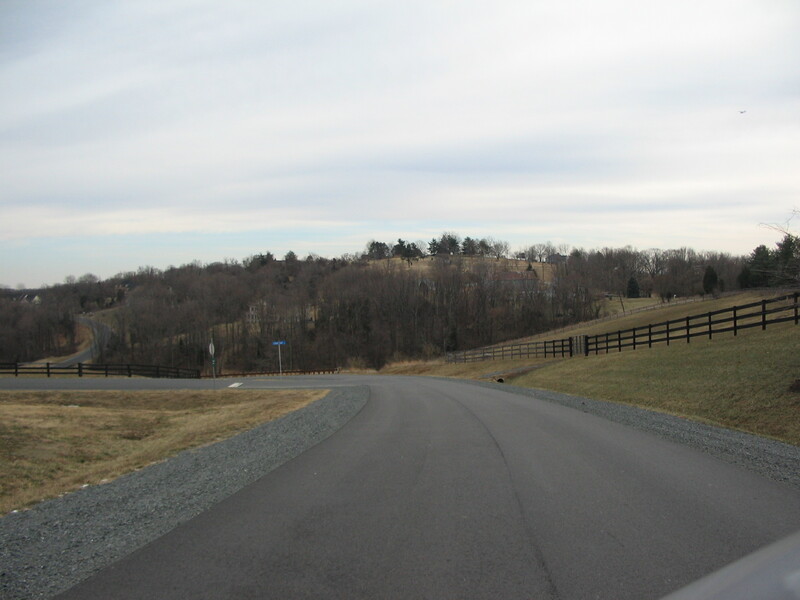 Beauregard Estates is on the north (left) of the Parkway, and the subdivision is gated. As it is within a residential area, the ground has been disturbed. However, some sources say there are remains extant in a small stand of woods at the top of the hill. The site is adjacent to several homes and there is little to inspect. However, looking down Beauregard Drive is a view more or less opposite of the photo from the Outlet Mall. In the center of view beyond the houses here is a large overpass for the interchange of Virginia 7 and US 15. And before leaving the vicinity of Fort Beauregard, a short drive further down Battlefield Parkway offers, at least for now, a wide view of the ground southeast of Leesburg. 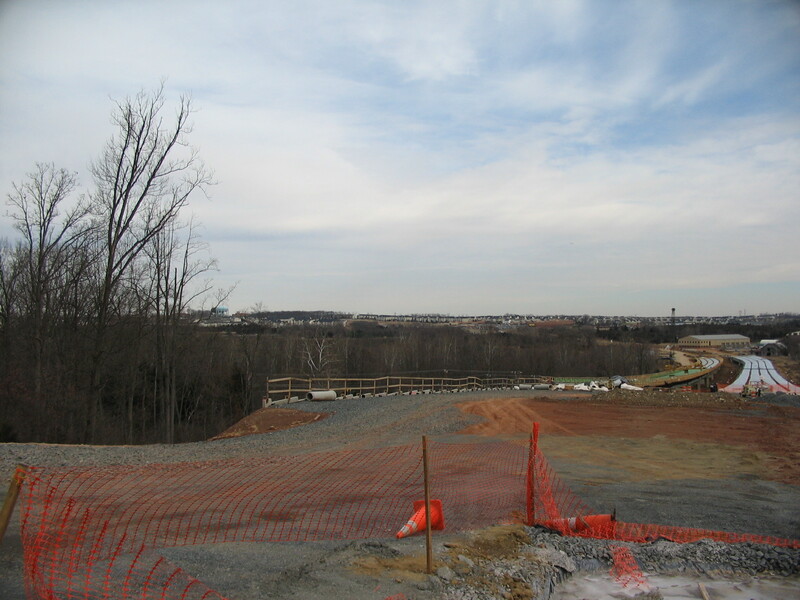 Near the city’s Tuscarora Creek Park, the clearings made for the completion of the Parkway allow views of the Fort Evans site and the ground down to Goose Creek. In the first view, on the left past the foreground trees are the water towers near those extended infantry trenches close to Fort Evans. The “under construction” parkway of course is on the right. The bridge there not only crosses Tuscarora Creek, but also the W & OD Railroad Trail. Or what was known at the time as the Alexandria, Loudoun, and Hampshire Railroad. Panning a little further to the right, a set of yellow buildings comes into view. 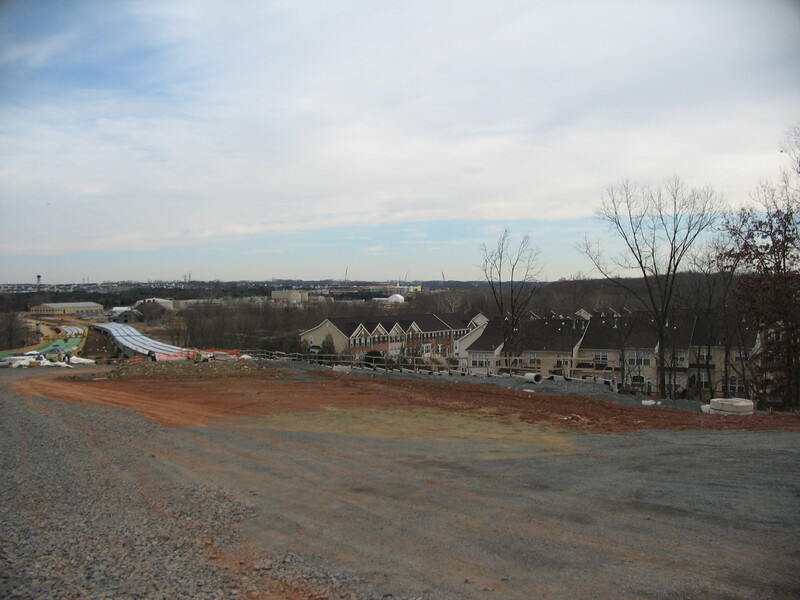 Just beyond those buildings is the “Keep Loudoun Beautiful” Park and the location of the “burnt bridge” during the war. The straight line distance is about a mile and a half. Of note, in each of these views, is the change ongoing with the addition of the Parkway. Also on high ground overlooking town, Fort Johnston was built to the west along the Catoctin Ridge line. Its purpose was to guard the westward roads leading to Key’s and Snicker’s Gaps on the Blue Ridge. Engineers located the fort on a 670 foot elevation with clear views across town and well to the northeast. 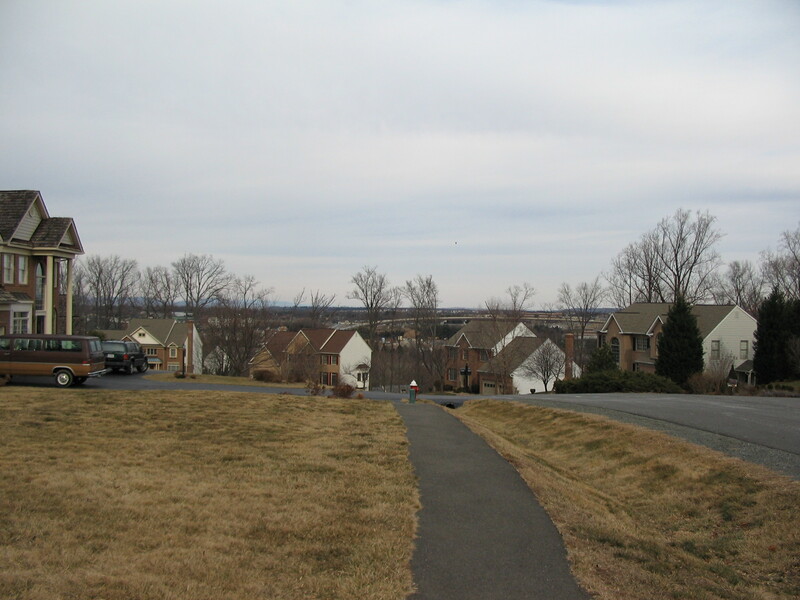 Views to the west covered sections of Loudoun Valley. The fort was a large four sided star, each arm measuring 110 feet. Unfortunately, as with Fort Beauregard, no engineering diagrams survive for reference and the site is entirely on private ground. One can view the works either by way of overhead photos, or at a distance from nearby public roads. Alysheba Drive to the west of the fort location offers the best, in my opinion. From what I see in the overhead and from a distance, the fort has at least two bastions remaining. The Milner Associates study produced a 1937 aerial photograph offering tantalizing details of the fort, when the knoll was an orchard. If even half of those seen in 1937 are extant today, there’s an impressive set of earthworks on the hill. Neither Forts Beauregard or Johnston witnessed any major fighting. In February 1862, then Federal Colonel John Geary led his command toward Leesburg on the heels of a Confederate withdraw from Northern Virginia. Geary occupied Fort Johnston first and placed artillery as to support his advance into Leesburg. Later the Federals occupied Forts Beauregard and Evans briefly before moving further south into Loudoun Valley. As an interesting side note, Geary’s command included a section of “Coffee-Mill Guns.” While not used at Leesburg, the guns continued to accompany Geary’s column south and were used around Middleburg, marking the first use of what one might loosely call a “machine gun” in combat. In closing this part, I’m left with a feeling that there’s more left to uncover about these forts. Little is documented, and at least in the case of Fort Johnston, a formal site survey is warranted. 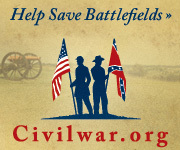 Didn’t know much about Leesburg’s civil war involvement except for Balls Bluff Park. Do you ever conduct tours of these areas? I’d love to see them firsthand. Jim L.
Jim, actually you are the only person who’s ever asked. These sites are easy to find with a knowledge of the roads. Plus, there are plenty of CW experts around Leesburg who could offer a much better presentation. What I’d recommend is visiting Balls Bluff during the summer weekends. The NVRPA volunteer guides conduct tours of that battlefield from 11 a.m. to 1 p.m. While not directly associated with the forts, they can give you more context to the Civil War activities in Leesburg. Send me an e-mail. While doing some foot recon for my son’s Eagle project I came across a VERY interesting possible battery sized (plus inf reg -) sized footprint of what may be a star shaped fortification east of Leesburg. My friend’s parents own one of the two homes at the top of Fort Johnston Rd. I know for a fact, the the southwestern bastion is still preserved to a good degree. The views from the hill are quite impressive, Reston can easily be seen on a clear day as can the southern end of the Bull Run Mountains. I guess I’ve just been too afraid to just walk up and ask to view the fort! Certainly if the present owners are open to allowing a discrete visit, I would enjoy the opportunity to view the works. Generally though if the road is posted, I respect that line. I would be happy to try and help arrange for you to visit them if you don’t feel comfortable driving up and asking yourself. I am curious, have you done any research on other fortifications in Loudoun, such as those on Loudoun Heights and Short Hill Mountain? I know the former was fortified during the Battle of Harpers Ferry (at least 1 emplacement is visible from the Loudoun Heights trail) and later used as an encampment for Cole’s Maryland Cavalry, while Geary placed artillery atop the Short Hill after crossing the Potomac in 1862.
there are some blockhouses and rifle pit ruins to see. But it is one heck of a hike. I’ve a mind to explore Short Hill Mountain in the fall (better after the foliage is down to find any remains). I’ll send you an email about the visit to Fort Johnston. Luke: I was up there about 3 weeks ago and met one of the home owners, a Mr. Stan James, who was gracious enough to show me around. You are absolutely right. There are still some really good entrenchments up there and the views are spectacular all the way around. Obvious why it’s a fort location. Jim, I know both the James and Henry families, we all used to live near one another on Phillips Dr many years ago. I am glad they own the properties and Ft. Johnston as they are both respectful of the earthworks. Good to hear you got to view the site. My parents own one of the houses in Beauregard Estates that backs up to where the fort was on the hill. I would be interested in more info on this fort, and any renderings if there are any…there isn’t much info on the web. Next time I visit, I’m going to head up in the woods and take a look around. All the years I lived there, I never once went back there! Michelle, I have not run across any wartime photographs or sketches of Fort Beauregard. Unlike Fort Evans and Fort Johnston, not enough information exists to even provide a trace plan of Fort Beauregard. One of these days I’d like to walk through the woods there with my measuring stakes in hand, and plot out any “disturbances” in the ground. Is Pot House the same as Pot Furnace that is listed on 1st VA Cav Co H Confederate Service Records for May/June 1863? I see no mention of 1st VA there but it was essentially my GG Grandfathers back yard. Ft Johnston Rd is the road I live on and I would greatly like to see the Mlner Assoc, 1937 aerial photos of Ft Johnston. Any possibility? Diana, since the photo is not in any online collections, I would recommend a trip to Balch Library to see the copy of the report on file there.